We can't think of any other cons! The trouble with traditional Italian wood fired ovens is that they’re a little… cumbersome. They are usually built with brick and clay, and are not designed to be portable – they live in the garden. The benefit of owning a wood fired oven like the Igneus Classico is that you get all of the gorgeous aesthetics – if a little more modern – with less of the weight. The Igneus only weighs 45kg, and with the fire bricks removed it can be easily manoeuvred by one person – and even packed into the boot of the car for a weekend away. So if you’re a serious pizza enthusiast, but you don’t fancy splurging your savings on a traditional home-built pizza oven, this sturdy stainless steel alternative could be the perfect choice. The Igneus Classico is available in 6 different colours: verdigris blue, matt black, aubergine, copper, graphite and red. Ideal if you want to add a splash of colour to your garden, or keep it more muted with the graphite. We particularly like this shiny red version that looks a little like a steam train! The inside of this wood-fired pizza oven measures 60x60cm and is lined with firebricks for insulation. You should be able to cook 2 12” pizzas at a time. 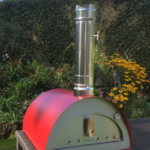 But what’s really got customers raving about this pizza oven is that it’s also great for roasting, baking and cooking a range of other delicious fare, whether it’s a lamb roast or a casserole with crusty bread. The best kindling to use with this oven is seasoned or dried wood, if you want to get that traditional wood-smoked taste. 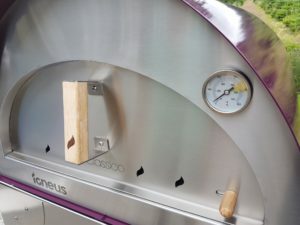 The Igneus pizza oven is a little bigger than its cousin the Uuni, so you will need to make sure you have enough space for it, and an adequate heat-proof stand or tabletop. It’s worth investing in the custom-made all-weather cover to keep your pizza oven protected from the elements when it’s not in use – which will likely be rare. This oven is the perfect party centrepiece, ideal for a summer gathering where you will need to feed lots of hungry people! Crank up the BBQ and fire up the Igneus, and you have a feast on your hands. Due to popular demand the Igneus sells out very quickly, so if it’s currently available online (or in-store near Harrogate) then get your order in fast. Without a doubt, this is one of our top-rated pizza ovens – at great value for money.